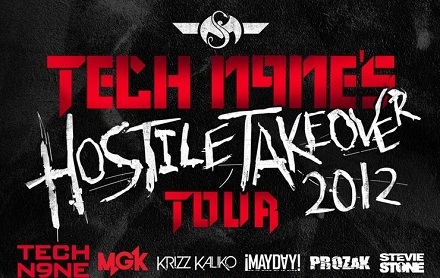 Tech N9ne’s “Hostile Takeover 2012” Tour will take Strange Music across the country on a staggering 90 shows in 99 days – the longest tour in rap history. Before the country gets a taste of Strangeland, Tech N9ne’s hometown of Kansas City will be the first point of impact for the tour. With CES Cru, Stevie Stone, Prozak, ¡MAYDAY!, Krizz Kaliko, and Machine Gun Kelly all in one spot, fans in Kansas City will witness the beginning of a record breaking summer for Strange Music. From Washington to North Carolina, fans from all over have made plans to kick off the “Hostile Takeover 2012” Tour in Kansas City. Will you be there to experience the one time event? “Coming from the Lou, picking up one friend from Lincoln, MO, and another from Springfield, MO, and meeting my brother in KCMO! Get your TICKETS and VIP PACKAGES to the Kansas City date of the “Hostile Takeover 2012” Tour. Will you be attending the Kansas City date?